outdoors, their window lights flickering in a sleepy field of snow. That’s what is portrayed so beautifully in his Spirit of Christmas collection. 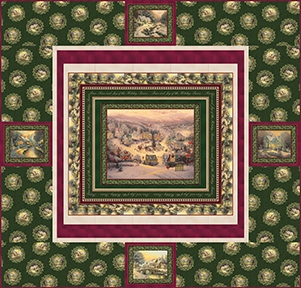 The panel, stripe and wreath print all convey that peaceful time and place. The stripe includes words such as “peace and joy,” or “blessings of the season,” and is just perfect for cutting up to make multiple projects. You can share his joy with others with this truly lovely collection from a truly talented artist.